Movements are announced and made sequentially, one ordered unit at a time, in the sequence of a player’s choice. A player must complete one unit’s movement before beginning another. A unit may only move once per turn. A unit that is ordered does not have to move. Ordered units may move from one section of the battlefield into another. A unit may never move onto any of the half-hexes that border the side of the battlefield. 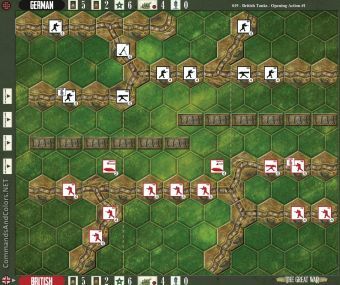 A unit may only move off the battlefield’s baseline hexes when explicitly allowed in the scenario notes. Two units may not occupy the same hex. When moving a unit, the unit may not move onto or through a hex occupied by a friendly unit or an enemy unit. A unit may not split off individual figures from the unit; they must stay together and always move as a group. A unit that is reduced through casualties may not combine with another unit. Some terrain features will impact movement and may prevent a unit from moving its full distance or battling. Retreat movement rules vary slightly from ordered movement: see the Retreat rules section. 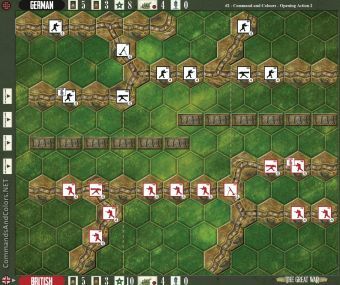 An ordered infantry unit may move up to 1 hex and battle, or 2 hexes and not battle. An ordered machine gun or mortar unit may move 1 hex, but may not battle when it moves. An ordered reserve artillery battery may not move.